In the Volvo Ocean Race, Groupama sailing team are leading the charge to trade winds that promise to slingshot the first to reach them into a powerful position in the race to Auckland, New Zealand. Franck Cammas’ team continue to make steady gains on every yacht in the fleet clocking up 428 nautical miles in the past 24 hours, edging close to the 478 nm that scored them the Leg 2 IWC Schauffhausen Speed Record Challenge trophy. Groupama 4’s increasing speed left second placed Camper with Emirates Team New Zealand more than 40 nautical miles in their wake at 1900 UTC. Rebels in the north, Puma Ocean Racing powered by Berg, are clinging to third position, just two nautical miles ahead of overall race leaders Team Telefónica in fourth. Team Sanya remain fifth and Abu Dhabi Ocean Racing sixth. Despite holding pole position Groupama 4 skipper Cammas knows that the next 24 hours are crucial, and reaching the trades is key to getting across the Doldrums unscathed. ‘For now we have to get into the trades tomorrow night and then maybe one day after we have to decide exactly where we go in the Doldrums,’’ he said. Abu Dhabi skipper Ian Walker warned that his team are far from out of the running with just under 4,000 nm of racecourse remaining. ‘What’s interesting right now is the balance between what you do short term to make yourself look good on the leader board and get close to Auckland, or whether you keep investing in the east to set yourself up for the longer term,’’ he said. 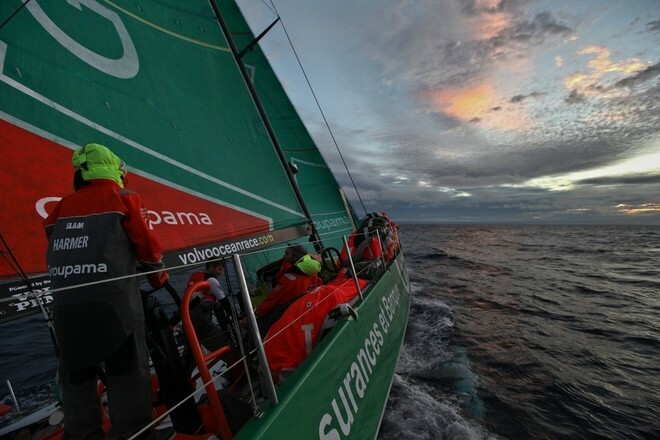 ‘We’re one of the more eastern boats now, following Groupama’s track. It’s a little bit scary for us, it looks like we’re losing miles to Telefónica, Camper and Sanya.